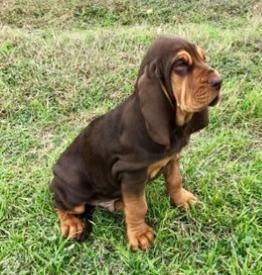 Ruger is a gorgeous baby of Blue, a Gunner pup, and working hound out of Kansas. He is the great-grandbaby of Bama and will be replacing him as my SAR dog. He has the sweetest temperament and absolutely beautiful coloring. We are looking forward to our next generation in working, and in pups from him.